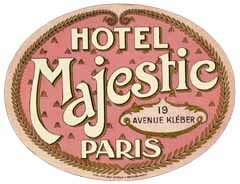 Imprimerie Boutillier was a Parisian printer that, in time, would specialize in the printing of hotel labels, much as Richter in Italy. 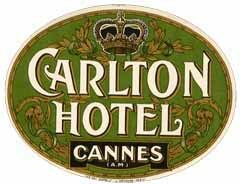 Boutillier's first hotel labels were issued around 1890 and those that I know do not show particular promise. The XIX century issues were marked "Imp. Boutillier". 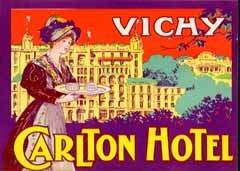 By the early 1900s Boutillier had developed his style: a typical label of the time was elliptical with the name of the hotel in a tasteful Art Nouveau or calligraphic lettering, over a decorated ground, often with the use of gold ink. 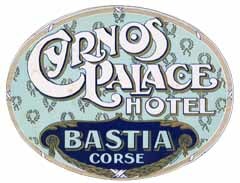 Such designs were produced for some of the most famous French hotels of their day and the best of them are of timeless good taste. 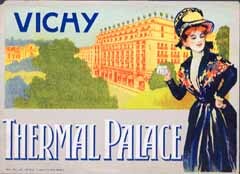 By 1911, labels were being marked "Pap Imp des Hôtels, A.Boutillier". 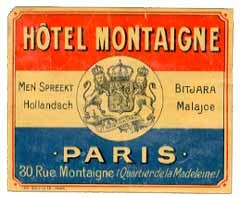 From the trade name used by the printer (roughly translatable as Paper-supplier and Printer to Hotels) we may deduce that, by this time, the demand was large enough for Boutillier to make of the hotel business its niche. 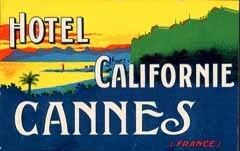 Other marks of the 1910s included "Imp. A.Boutillier" and "Imp. A.Boutillier 1, rue du 29 Juillet, Paris". But many labels recognizably printed by Boutillier were unmarked (although, occasionally, unmarked labels are found with a hand-written note identifying the printer). 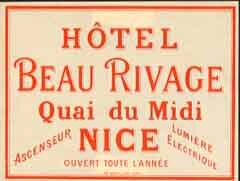 During the First World War, the original owner sold (or lost control over-) the business, so that by 1917 labels were being marked "Imp des Hôtels J.Devouge, Paris". 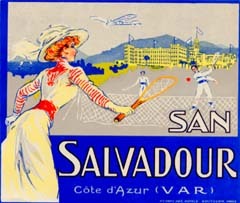 During the 1920s, the company produced some interesting deco labels. At the time the printer's issues were marked with the texts: "Pap. Imp. 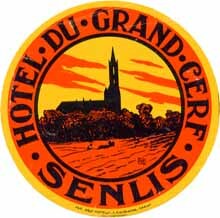 des Hôtels, 1 rue du 29 Juillet, Paris"; "Imp des Hôtels, G.Grandjany, Paris"; "Devouge, Grandjany Sucs. 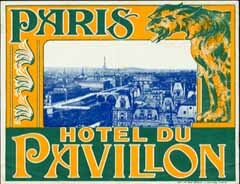 "; or "Imp des Hôtels, B.Grandjany, Paris". As Richter, Boutillier developed a characteristic style that was imitated by others. However it was not quite as graphic and, after two decades, it was abandoned. As Richter, Boutillier produced some spectacular designs but the catchiest of these were one-of-a-kind and did not have, as in Richter's case, the family resemblance that defines a style. 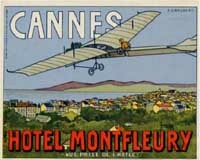 Appropriately Boutillier remained a printer for French hotels and never expanded significantly beyond the country's European borders.